These spongy almond cakes are baked in a water bath, which gives them a lighter, airy texture. 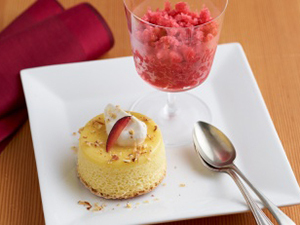 An icy plum granita and toasted almond whipped cream balance the dessert with textural contrasts. 1. Lightly oil and dust small ramekins with sugar. For the steamed almond cake: In large bowl, combine flour, milk, orgeat and egg yolks. Gently fold in egg whites with a rubber spatula. 2. Fill ramekins halfway with batter and cover with foil. Bake in water bath at 350 F with convection for about 15 minutes. Remove foil and bake another 12 to 15 minutes until cakes have risen and are lightly browned on the top. Remove from oven and cool. Enjoy at room temperature or refrigerate overnight. 3. Meanwhile, prepare the toasted almond cream: In medium saucepan, combine toasted almonds and cream. Heat mixture over medium heat until it starts to simmer. Remove from heat and let cool. 4. Strain cream mixture through cheesecloth; discard almonds. Whip the almond-infused cream and season with salt and sugar. Refrigerate until ready to use. 5. For the plum granita: Cut up, puree and strain the plums. Stir in Moscato, salt, sugar and lemon zest and mix well. Freeze in a metal pan. 6. For service, unmold cake on dessert plates and garnish with plum granita and toasted almond cream.